Coyotes are significantly smaller than wolves (typically about 1/3 the weight), with longer, more pointed ears and a narrow pointed snout. Although they are about the same size as red foxes, you can tell the difference because of the fox’s white-tipped tail and black “socks” on its feet. When wolves were eliminated from Yellowstone, the coyote population exploded. After the Yellowstone wolf reintroduction in 1995, the coyote population dropped. Coyotes are commonly seen all over the Yellowstone ecosystem. Coyotes are omnivores. In this ecosystem, they eat mostly deer, rabbits, and rodents, but they’ll also eat fruits and grains. At the Sanctuary, our coyotes eat a variety of meats along with dry kibble for extra nutrition. Coyotes have a pack structure similar to wolves, except that their packs tend to be smaller family groups. The dominant coyotes (“alpha pair”) are the only ones in the pack that breed, and the others help to raise the young. When one of the alpha coyotes is killed, all of the coyotes in the pack breed. When a coyote group feels threatened, females will go into estrus twice per year, and have as many as 5-7 pups per litter instead of the usual 2-4. Coyotes are highly adaptable, and have expanded their range dramatically in the last 200 years. Originally found mostly in the plains areas along both sides of the Rocky Mountains in the U.S., they are now found from the Atlantic to the Pacific and throughout northern Mexico and southern Canada. There are urban populations in many major U.S. cities, and a recent population survey showed over 2,000 individual coyotes in Chicago and its suburbs. Coyotes help prevent the spread of zoonotic disease by controlling rodents and other urban pests. Coyotes live up to 14 years in the wild, but can live over 20 in captivity. SCOUT was found as a tiny pup along with his littermate, Lola. The people who found them mistook them for dogs and took them to an animal shelter, where they were bottle-fed. LOLA is Scout’s sister. 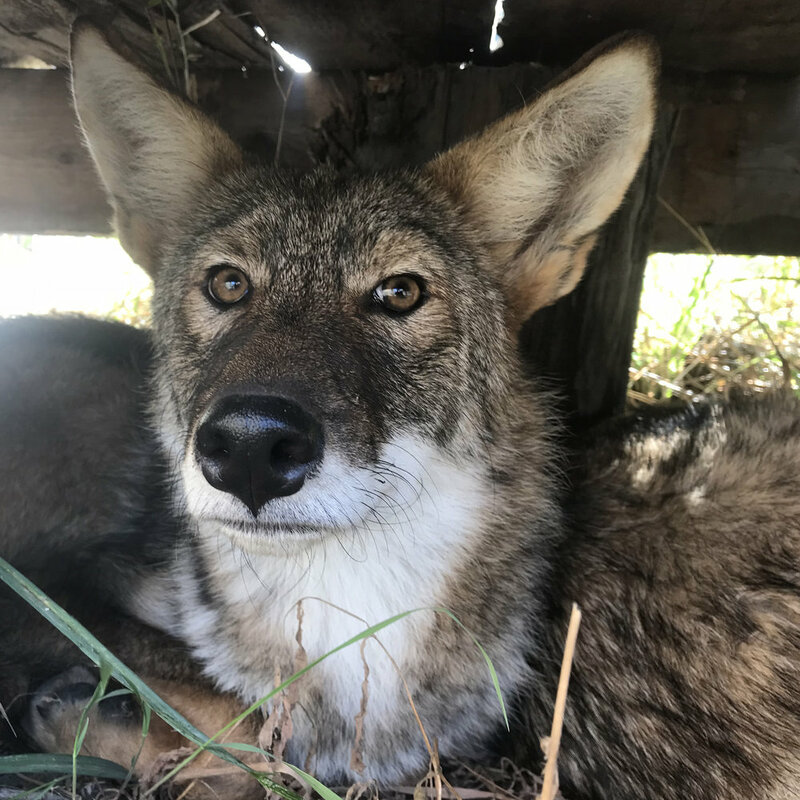 When the people at the animal shelter realized she and Scout were coyotes, they were transferred to a rescue facility, which declared them too habituated to be released. They came to us in October of 2018.